A written resume – a GOOD written resume can take a long time to perfect and to get right, it can often be lost on a desk full of other resumes and applicants. Is there another way of making sure your resume stands out?? For some industries a good way to get noticed is to remove yourself from the pile of written resumes and show potential employers your personality. 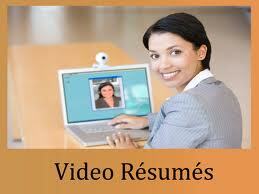 A video resume can also make it easier to – make an impression and to be remembered. The first thing when thinking of a career change or just seeking employment is to look at the industry you are applying to. If you are applying to a traditional company with conservative values, you’re best off leaving the video resume at home. Remember that a video resume is not appropriate for every job or industry out there. Be mindful of WHO you are making the video for, if the position calls for someone who is bubbly, confident and outgoing, make sure your video shows that. You need your video to be suitable for the job and industry you are applying to. Be different! Your video resume is not there on its own, it will be there with your traditional resume. Make sure that your video is short and to the point, your paper resume will cover all the facts, accomplishments, previous employment, career goals and all your relevant information. The video resume is not you sitting there reading your resume, it’s your chance to show a potential employer who you are, what you can do, what you can bring to the job, and brings your written words to life. Show them who you are, what you can achieve and convince them you are right for the position by mentioning your skills and experience. Keep things *tasteful* there is a big difference between a home movie and a video resume. You are still applying for employment, so you need to show your professionalism and that you are taking your career and the application seriously. You want to make an impression – but for all the right reasons, dress the part, assess the vibe of the company, and look like you’ll fit right in. Be yourself; be as honest and as natural as you can. Don’t go for cheesy special effects, (unless you are going for a job that calls for this kind of talent) and try to keep it short, aim for about one minute in length. Provide your resume with your video on both CD and DVD discs, to make sure the interviewer will have equipment available to view your resume. If you are e-mailing your written resume, upload your clip to you-tube and include a link with your e-mail and resume. Be creative, this is your chance to show a potential employer – what you’ve got – your clip needs to show that you deserve the job, or at least a follow up face to face interview. Practice, while news reporters and soapie stars make it look so easy, it takes a lot of time and practice, so don’t be disheartened if your first attempt looks like a disaster, be prepared to do many retakes, but try and stay relaxed and natural and don’t forget to smile. Have you made a video resume?? Did it help with gaining and interview or a job in your chosen career? What information did it contain? Do you have any suggestions to share, or things to avoid?